The United States added a healthy 242,000 jobs in February, far better than its gains of 172,000 in January. 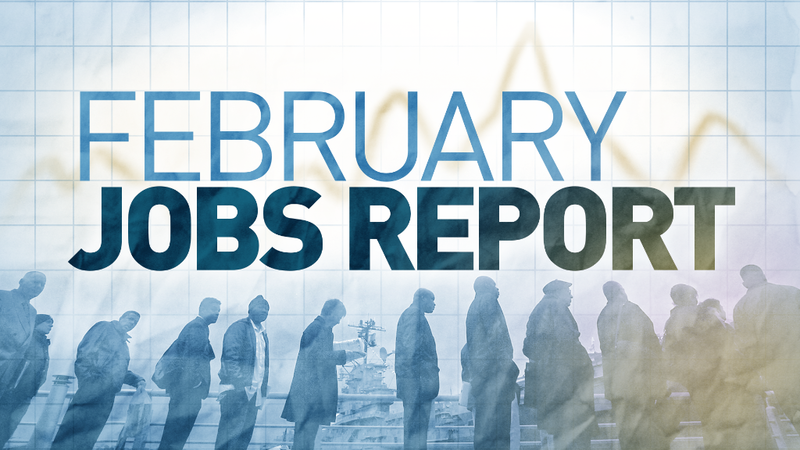 Economists surveyed by CNNMoney had predicted a gain of 190,000 jobs in February. Unemployment stayed at 4.9% last month, the lowest mark since February 2008. It's at a level many experts consider to be "full employment." "There's still good reason to be optimistic about the U.S. economy," says Andrew Chamberlain, chief economist at Glassdoor. The job market's momentum is cooling concerns from earlier this year that the U.S. economy would fall into recession in 2016. February's gains are the latest sign of good news: retail sales were solid in January and growth appears to be picking up. Related: Could Donald Trump cause a recession in the U.S.? More good news: job gains in December and January were revised up by a combined 30,000 jobs. And more Americans are getting on the band wagon: the participation rate -- an indicator of how many people are working or looking for work -- increased in February. Participation has trended upward since September even though it's near historical lows. "The participation rate pick up has been quite surprising," says Bricklin Dwyer, an economist at BNP Paribas. Friday's job news wasn't all good. The sectors with the biggest gains -- retail, restaurants and social assistance -- are considered to be low-paying jobs. And the energy sector, battered by low oil prices, cut nearly 20,000 jobs in February. Wage growth also disappointed in February. Wage only grew 2.2% in February compared to a year ago. That's below the past gains of 2.5% or more in previous months. The Federal Reserve wants to see wages grow move closer to 3.5%. Despite those disappointments, overall progress in the job market is a sign of the U.S. economy's resilience in the face of a global slowdown. Other parts of the world -- from China and India to Europe and Latin America -- are suffering from slowing growth. The U.S. economy isn't immune to the headwinds from abroad: the U.S. manufacturing sector is in a 5-month recession. Still, the economy has shown signs of strength early in 2016 amid many red flags from overseas and the negative talk from U.S. presidential contenders, says Jack Kramer, co-founder of MarketSnacks, a daily financial newsletter. "If you read the front page of newspapers today, you'd think the economy is crumbling," says Kramer. "Things are much better than those headlines would make you think."